While the term fatty acids may not get your mouth watering, they're actually a ridiculously important part of your diet. Why? Because your body can't make them. You need omega-3s for energy, brain function, and routine cell maintenance, but that's just the beginning when it comes to their health benefits. For instance, because they reduce inflammation, omega-3s may help decrease the risk of some of the scariest chronic conditions. OK, so there's no sword fighting involved. But high cholesterol -- the waxy, fat-like gunk that builds up in your arteries -- can be a sign that you're at risk of having a stroke or heart attack someday if you're not careful. 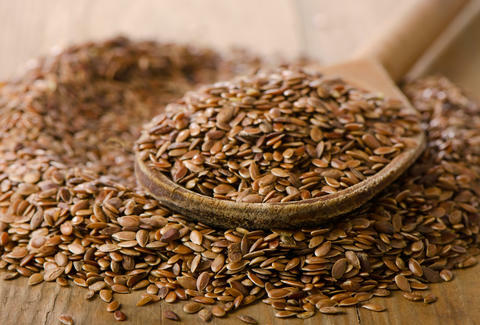 Those with very high cholesterol may require medication, but flaxseed is a valuable weapon if you want to go au naturel. If you don't know what I mean, I'm talking about your bowels. Flaxseed is full of fiber, which is pretty much a lifesaver in embarrassing situations such as gastrointestinal discomfort and constipation. All clear in the poop department? Good for you, but flaxseed's fiber content can also help in other ways, such as regulating your blood sugar levels and keeping your weight in check. The seeds of the flax plant are teeny-tiny, so it's easy to sprinkle them on or stir them into just about anything without much effort. That said, they do have a nice nutty flavor, which makes them a nice complement to lots of dishes. For breakfast, add them to your oatmeal or yogurt. For lunch, sprinkle them on a salad. For dinner, knead them into bread or pizza dough. You can even use them as an egg replacer when baking. If you want to get the most out of these wunder-seeds, go for the ground version, also called flaxseed meal. The whole seeds can sometimes travel through your system without being digested, robbing you of the full force of their superpowers. Katie McDonough is a freelance writer and editor who puts flaxseed in everything because she has high cholesterol (it's genetic!). Follow her @thewritekatie.